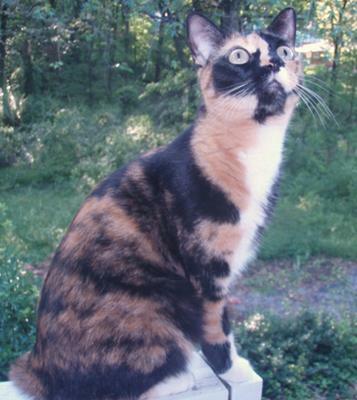 Orian is a beautiful calico who I rescued from a place of horrible conditions. The previous owners had 11 animals in their home which included 3 cats and 8 pit bulls. The house smelled so bad that you could not breath. Orian was a single kitten that was born to their two cats, so I decided to take her home. None of those animals had been fixed. Orian has been spayed and has had all her shots and is doing well. You must see how beautiful she is, so here is a photo! Thanks for sharing your cat's story. I'm so glad you were able to rescue her from those horrible conditions! She is an unusual cat isn't she? Beautiful markings and a unique "look" -- She looks like she has found her home for life with you! Congratulations to you both. That cat is so adorable. I know what means by she was in a horrible place because I lived at my aunts and it was a horrible place and I cat, but my aunt she has a baby and her baby likes to go out in the back and one day I was going to hold the cat but she was gone see how terrible that is. Orian is a very beautiful princess. I love her coat pattern. She's so cute and expressive. Thank you for sharing your kitty's picture.